Calling Union Law Minister Ravi Shankar Prasad a "minister of lies", Congress on Thursday asked the BJP that if Cambridge Analytica (CA) was involved in stealing data, then why did it take its services and whether it would register an FIR against CA and its Indian arm Ovleno Business Intelligence (OBI).The party also said that Minister of Information and Broadcasting Smriti Irani follwed Cambridge Analtytica on Twitter and Bharatiya Janata Party (BJP)'s former IT head, Arvind Gupta -- who currently runs government's biggest portal (mygov.in) -- had termed CA a "powerful tool". "BJP government has now become a manufacturer of fake news and an eptiome of post-truth. The business alliance between BJP-JD(U) and Cambridge Analytics has now been exposed," Congress spokesperson Randeep Singh Surjewala said.He said "now a new fake agenda" is being used to stop the proceedings in Parliament" and instead of Law Minister, Prasad should be named a "lie minister". "One who stole data (Facebook and Mark Zuckerberg) is also Prime Minister Narendra Modi's friend. Still they are shouting so much. Modiji and Prasad must reply to a few questions," he added. "Didn't they (BJP and Modi) take services of OBI and CA? For Mission 272+, this company was used. Didn't you know they were involved in stealing data?" Surjewala said.The Congress party also said: "Didn't BJP use the services of CA's Indian arm OBI during its election campaign in four states -- Jharkhand, Haryana, Maharashtra and Delhi? Didn't BJP's former IT head Arvind Gupta praise the company? ""Gupta said CA is a 'powerful tool' and when used correctly can provide deep insights and fine-tune communication and outreach strategy," Surjewla noted. "If CA steals data, then why is Smriti Irani following the company on Twitter? Are thieves being followed by ministers. Will he assure the country that he will lodge an FIR against CA, OBI and SCL (Strategic Communications Laboratories) -- CA's parent company?" he further said.He also asked why isn't Modi government filing an FIR against Cambridge Analytica, if it is involved in data stealing.The party also asked: "Is it not true that in 2010, during Bihar election, BJP and JD-U used the services of CA and OBI. "The leader said: "Isn't Modi government a data leak government? There are several instances of data leak under ths government. 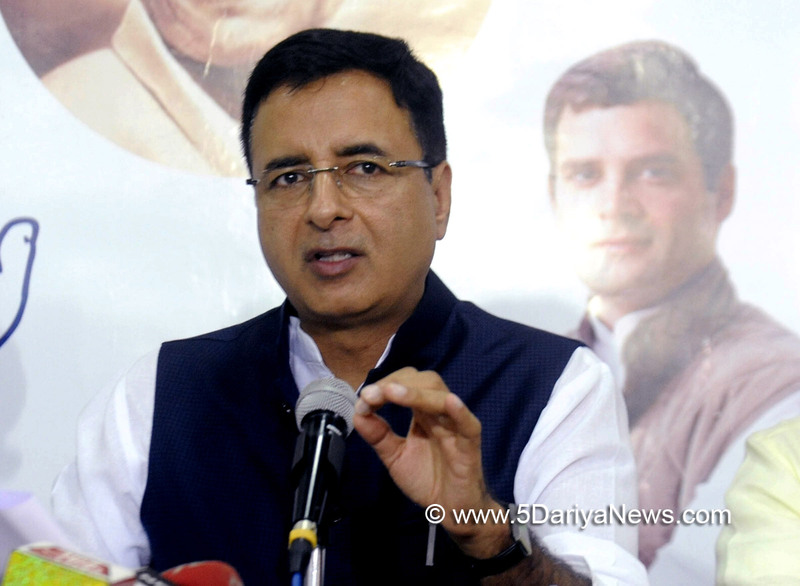 Citing an article, Surjewala said: "Amrish Tyagi (K.C Tyagi's son), who runs the OBI, had worked in the US President's war-room, and now says in an article that CA is his partner and friend. ""They should reply to these questions. It just won't work to divert attention from Nirav Modi and Mehul Choksi escape, Rafale deal, 39 Indians' killing in Iraq, SSC scam, unemployment issue and farmers' crisis, in Parliament," he added.Asked about Prasad's allegation that the firm was involved in Congress President Rahul Gandhi's social media campaign, Surjewala said: "I have placed the facts as they exist. I have also said categorically and let me reiterate it that Indian National Congress or Congress President have never hired the services of Cambridge Analytica either in the past or currently. That should settle the issue. ""Moreover, the firm works with facebook and not Twitter? The IT minister should know this before making allegations. This is atleast expected from the IT minister," he added.